The Galahad band enters the jubilee year of the thirtieth anniversary of its existence. And it comes with the deluxe edition of the album "Empires Never Last" originally released in 2007. Few albums are as beautiful as this album and if someone has never listened to this album (which I do not think), this new deluxe edition can be the right opportunity. Stuart Nicholson and the band decided to resume the album, but instead of the usual reprint, they decided to intervene in some of the songs and using the latest recording technology they improved the sound and changed some fragments so as to get, as a result , a job that meets today's quality standards. The work was done in Thin Ice Studios under the reliable eye of Karl Groom so now we have obtained not only a remastered and remixed album, but also with several newly recorded parts. 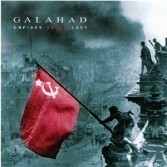 In addition, the deluxe version appears in an elegant digipack with a slightly richer graphic design and, what most appeal to fans of the Galahad group, contains two new unreleased recordings. These are the semi-acoustic versions of the songs "Termination" and "This Life could be my last", which are a sufficient attraction to encourage even all the owners of the original version of the disc to purchase this new enriched version.